Successfully Added Android Projector Phone - Android 5.1, 35 Lumen Projector, 4G, 3GB RAM, Octa Core CPU, 64GB Memory to your Shopping Cart. Looking for a device that is one step ahead of the competition? This projector smartphone will let you easily make stunning presentations, comes with Android 5.1 interface, a 5.5 inch HD scree, octa core processor, a fingerprint scanner, 4G support and more. We expect a lot from our phones these days — and this projector smartphone is a great example of multi-functionality. It comes with a built-in 35 Lumens projector that you can use for loads of occasions. Make quick business presentations, display documents and files, show off your photos or take a quick break by watching your favorite TV show. Despite already having a major edge over the competition, the smartphone does not skimp on other features. 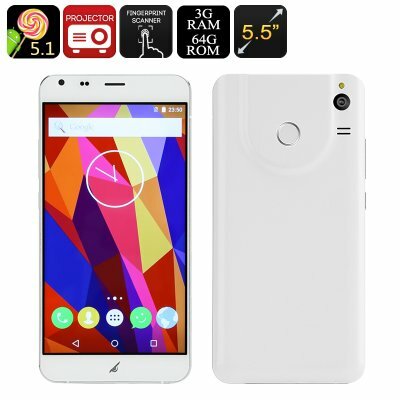 You will have a 5.5 inch HD screen and Android 5.1 interface for easy navigation and Play Store Access. With 4G connectivity, the projector mobile is great for staying in touch and browsing the web. Powered by the MTK6753Octa Core CPU and sporting 3GB of RAM, the smartphone can handle loads of multitasking and the Mali-T720 is great for gameplay. To make sure your privacy is protected at all times, the phone comes with a fingerprint scanner — so you don’t have to worry about your private files or photos falling into the wrong hands. The projector smartphone features 64GB of internal memory and 64GB supported externally — giving you loads of storage space for media, apps, games and the files you want to project. 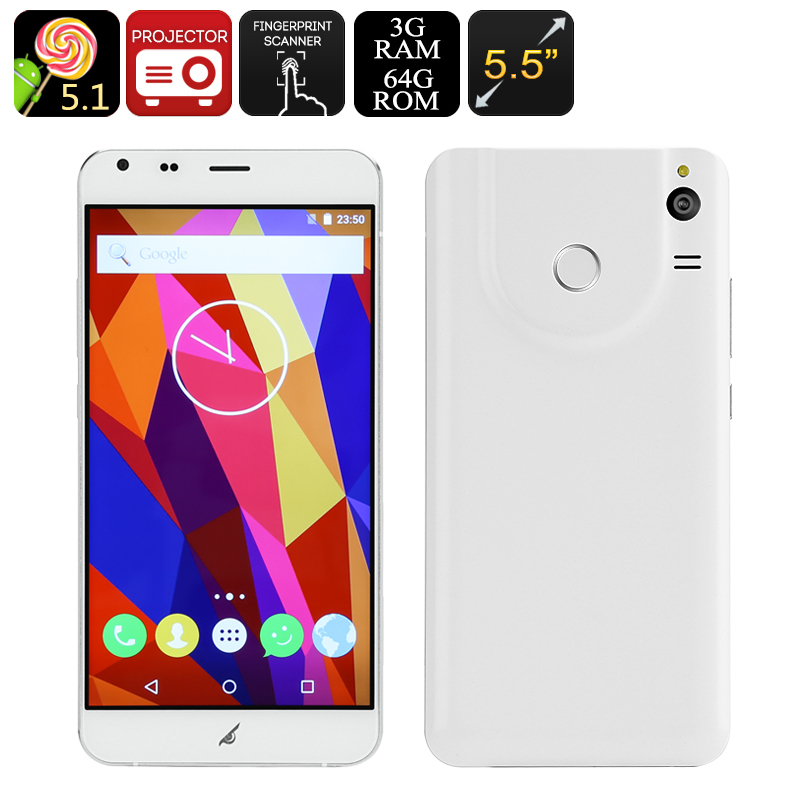 The Projector Android Smartphone comes with a 12 months warranty, brought to you by the leader in electronic devices as well as wholesale Android Phones..